The Gore Effect followed the former Vice President’s private jet to Europe this week. Tim Blair reported that skiing conditions are expected to be excellent across Europe this year. 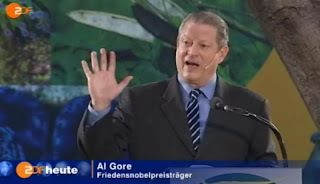 That’s correct… By 2013 Gore says there will be no ice at the North Pole. Actually, make that four years. Gore has been predicting this for a year already. For some unknown reason he’s still saying five years when one of those years has already passed.